Diving and checking its rich marine life has been a passion for Martin Bailey, a Scot, another reason why he keeps on coming back to the country, not to mention that his girlfriend is from the southern Philippines. A master diver, he’s been to popular dive sites in the world, but it is in the Philippines that he likes the most since dive sites in the country are mostly undiscovered by foreign tourists. 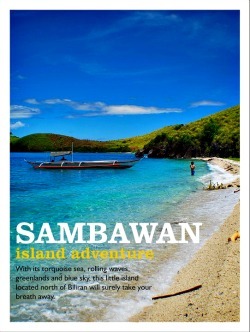 While online, Bailey clicked on a link that directed him to informative site about Sambawan Island. Curiosity struck him after he experienced diving in Southern Leyte. He immediately went to Biliran to check Sambawan Island and what it can offer to dive-loving persons like him. “Still a virgin dive site, truly a gem, which your government should protect, so this won’t be abused by people,” he shared. For five days, Bailey explored seven of the 11 Sambawan Island’s diving sites in Maripipi, Biliran province. “Night diving is better than going into the water in the morning because the true color of corals can be seen at night. They illuminate when light flashes unto them,” Bailey explained when asked about his experience in Sambawan. The island, composed of rocky islets with white sand beach and rich marine life and coral gardens, lays on the western part of Maripipi town. A declared fish sanctuary by the town government, Maripipi’s marine life came back to life after several years of exploitation that damaged some of its corals. “You can still see damaged corals. I hope that people who will visit this place are more responsible in protecting the environment. I can say that this is a virgin place that needs to be taken care and protected so more people would enjoy,” Bailey added. Diving in Sambawan allows tourists to have a close encounter with reef sharks and nurse sharks. Sighting of bull shark in the country was also first recorded in Sambawan Island. The locals have been visiting Sambawan to swim or to catch fish. The discovery and development of Sambawan as tourist haven came later after the passage of a law that declares the entire Biliran province as tourism development area. Aided with national law and local ordinances, fishing has been prohibited in the island, especially in areas declared as fish sanctuary, said Sonia Alavera, Maripipi town tourism officer. Since the promotion of Sambawan as one of Biliran’s tourist destinations, it has been attracting local and foreign divers. Presence of tourist lessens illegal fishing activities. Although Sambawan also offers diving for tourists like in Southern Leyte, Department of Tourism Regional Director Karina Rosa Tiopes said that the island’s natural resources complements with what Biliran province offers to tourists. “Sambawan is a different experience tourists will have,” Tiopes shared. Climbing up the hill to take selfie or groupie photos with panoramic view of the island as background, island hopping, and trekking to the other side of the island is delight for them, she added. The view deck at the highest hill in Sambawan gives tourists magnificent sunrise and sunset view of the hidden paradise. From the hilltop, tourists can glimpse Masbate province, Maripipi volcano and the main island of Biliran. Some island towns of Samar province can also be seen from the hilltop. Snorkeling and camping are other activities that can be done at Sambawan. A private developer is now tapped by the local government unit to develop and provide more facilities in the island for tourists to enjoy. Tourists from Tacloban City only need take two hour drive to Naval town, the provincial capital, and an hour travel to Kawayan port for a boat ride boat to Maripipi town. But if tourists are in a hurry, they can hire a pump boat to ferry them to Sambawan for special trip that will take for about 45 minutes depending on the weather condition. Tourists may also ride pump boats bound to Maripipi in the port of Naval that will take them for about an hour-and-a-half boat ride. For those coming from Ormoc City, travel to Naval town will take more than an hour by car. Open cottage (PhP 500 rental) and bahay-kubo inspired cottages (PhP2,500 rental, good for 10 people) are available at the island for tourists who wish to stay overnight. But for those who would want to experience an ordinary island living, they can do camping. Tourists who want to stay at the island overnight should bring food with them. The island is powered by solar panels and a generator. For souvenirs, Maripipi town is known for its native products made of nito, an indigenous material abundant on the island.